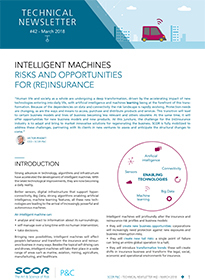 This Technical Newsletter shows how the development of intelligent machines will affect many aspects of our daily lives and behavior and transform the world of insurance and reinsurance. Strong advances in technology, algorithms and infrastructure have accelerated the development of intelligent machines. With the latest technological improvements, they are now becoming a daily reality. Better sensors, digital infrastructure that support hyperconnectivity, Big Data, strong algorithms enabling artificial intelligence, machine learning features, all these new technologies are leading to the arrival of increasingly powerful and autonomous machines. Bringing new possibilities, intelligent machines will affect people’s behaviour and transform the insurance and reinsurance business in many ways. Besides the topical self-driving cars and drones, intelligent machines will take their place in a wide range of areas such as marine, aviation, mining, agriculture, manufacturing, and healthcare. they will introduce transformative trends: these will create shifts in insurance business and transform the legal, social, economic and operational environments for insurance. By 2030, global demand for fresh water could outstrip supply by more than 40% if no changes are made to how we manage water.